Please Note: The Mecha Hack has everything you need to play! This game is based on The Black Hack, but it’s a full, standalone game, and does not require any additional products in order to use. Suit up with The Mecha Hack! 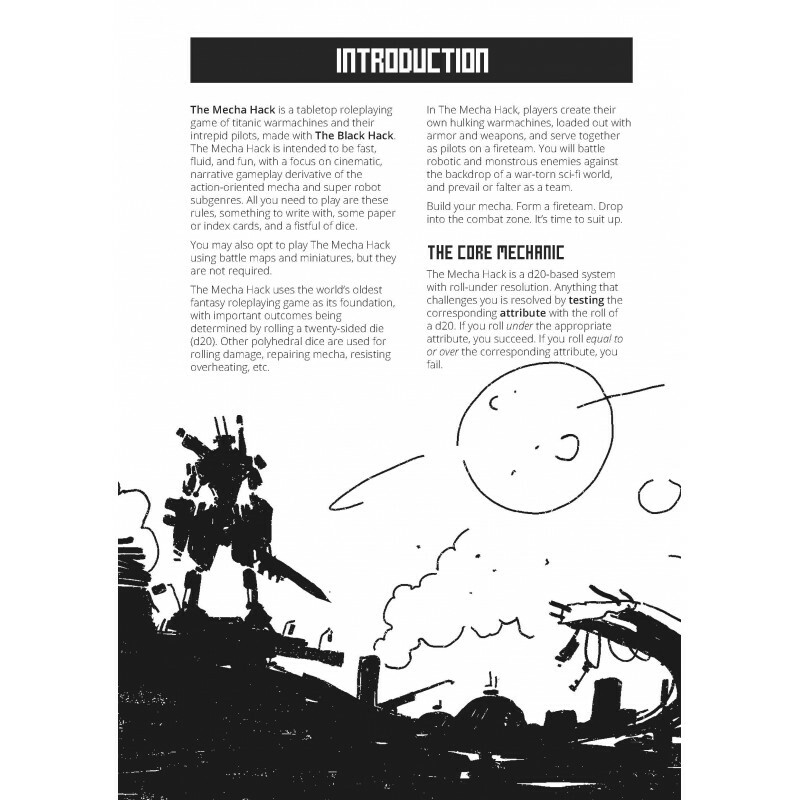 If you’re a fan of Gundam, Robotech, Pacific Rim, BattleTech, or Transformers, this is the rules-lite robot RPG you’ve been waiting for. 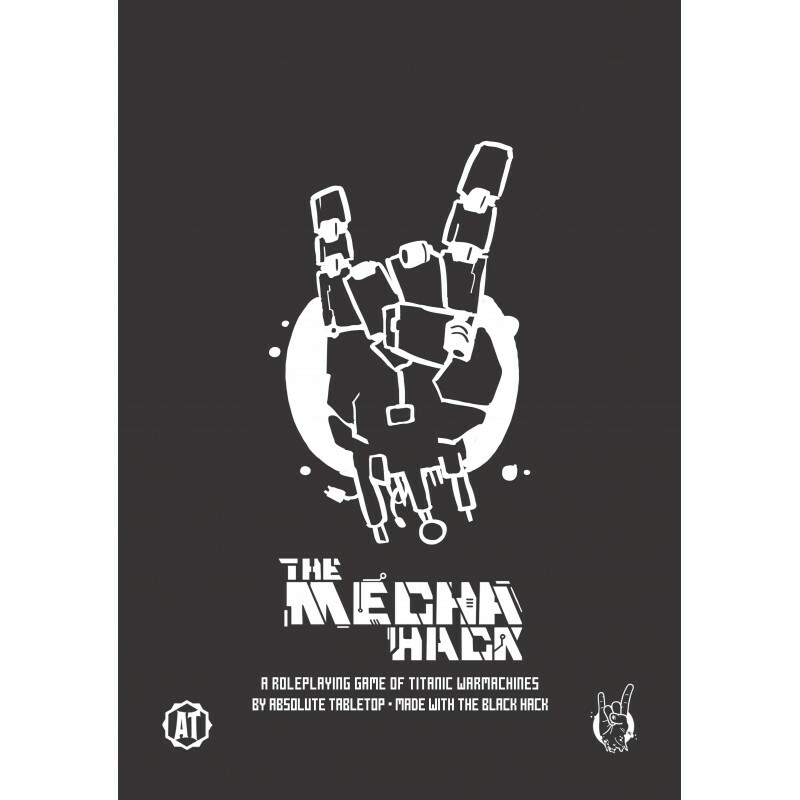 The Mecha Hack is a tabletop roleplaying game of titanic warmachines and their intrepid pilots, made with The Black Hack. The Mecha Hack is fast, fluid, and fun, with a focus on cinematic, narrative gameplay inspired by anime and other mecha properties. 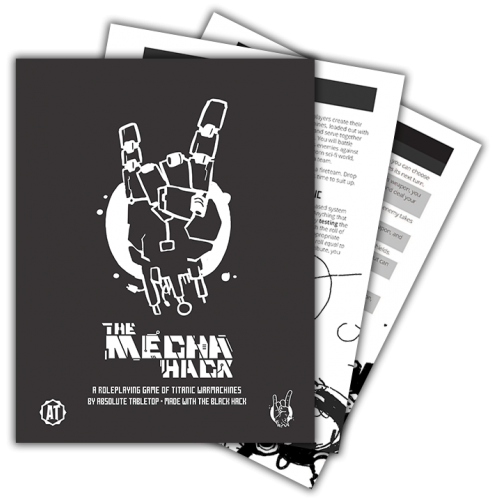 Inside this A5-sized, 40-page book, you’ll find the complete Mecha Hack ruleset; four mecha chassis and four pilot archetypes; over a dozen add-on modules for your unique mecha; GM tools and mission generators; more than 30 enemy statblocks; printable monsters, mechs, and objects; and so much more! 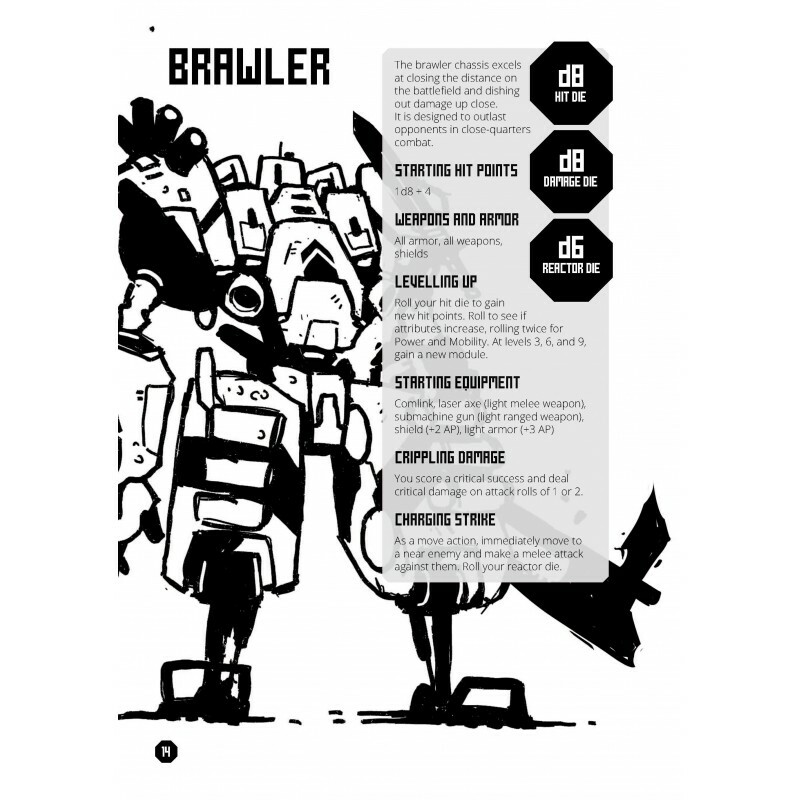 Jump into a full, standalone mecha RPG with everything you need to run a variety of missions – from all-out war, to stealthy skirmishes, to base defense, and more. Overcome challenges with a speedy and simple d20 roll-under resolution mechanic. Form-fillable character sheet PDF and printable A-stand paper miniatures included! Includes unit and terrain tokens for use with virtual tabletops like Roll20! Build your own unique mecha by choosing your chassis, pilot, and modules. Customize your mecha with tons of add-on options: weapons, armor, and consumables. Battle more than 30 unique enemies, including hostile mecha, monstrous kaiju, enemy factions, and more. Capture the tone of the super robot genre like never before with simple rules for overheating reactors, supporting allies, and tactical combat with cover and difficult terrain. Prep games in minutes using the robust GM tools with mission generators and sample challenges. 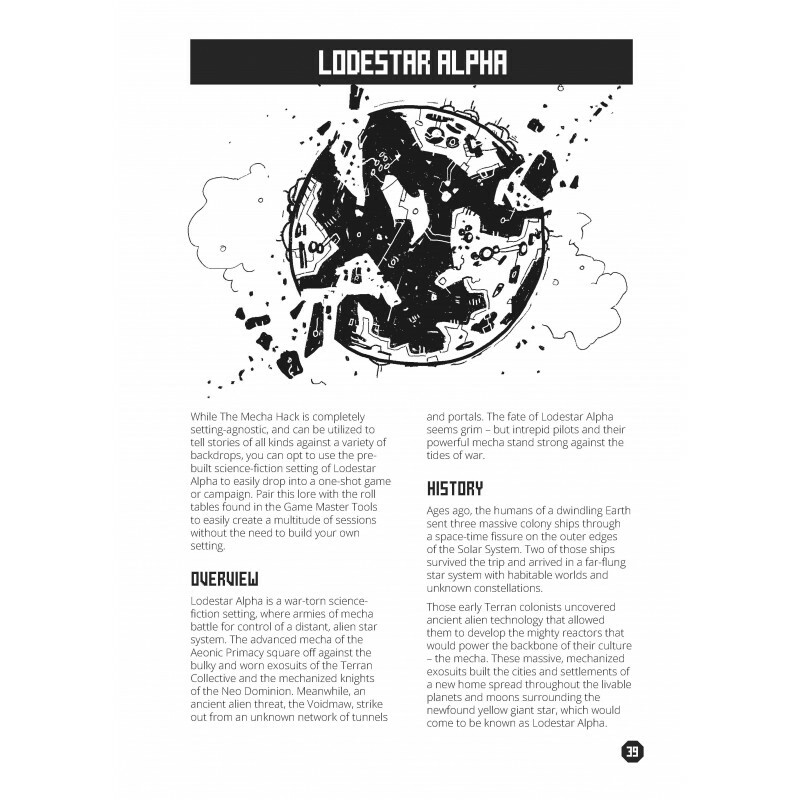 Discover the mini-setting of Lodestar Alpha – a war-torn world of the far future. Enjoy gorgeous, thematic art by Brandish Gilhelm of Runehammer Games. Build your mecha. Form a fireteam. Drop into the combat zone. It’s time to suit up, pilots. See The Mecha Hack in action!